Tuscan home decorating is warm and inviting and is inspired by the textures and colors found in nature. Color options for Tuscany decor are gold and yellow, dark green and sage, different shades of brown and ochre. These earthy tones can be found on walls, in Tuscany Furniture and rugs. These display the strong connection to nature that Tuscan kitchen design keeps. Unlike modern homes, villa style homes and farmhouses commonly have textured walls. This timeless look gives any space an Old World feel. This can be accomplished in various ways. One popular technique used is by incorporating materials such as Venetian plaster to add texture. 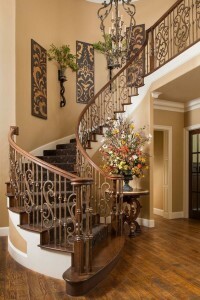 There are important details to focus on in decorating in this luxurious style. More and more homeowners are designing and building breathtaking Tuscany homes for their families. They are often looking for the open feel that Italian style living offers. Even if you are looking for Tuscan decor on a budget, this style is fabulous because you can create a beautiful space by using charming, aged pieces in this decorating style. Tuscany style decorating involves the use of natural materials for the flooring. Tile is most often chosen. Wood flooring and stone tile are great choices for this type of Italian decor. The use of Terracotta tile achieves the earthy feel you want to get from interior Tuscan decorating. Carpet is rarely chosen. Today, many homeowners are attracted to the idea of the kitchen being “the heart of Italian Life.” So, with this in mind, we take great care in making our Italian style kitchens extraordinary! Ways to achieve villa style kitchens are open shelving for cabinets and earth tones on the walls. There are so many other intricate details that make Mediterranean style decorating a success. You will realize this as you make your way through this website. But, along with functionality, the display of beautiful decorative pieces in which are visible on the open shelving can give your Farmhouse kitchen decor a true Mediterranean look. Unlike other Tuscan home decorating websites, we’ll provide you with up to date Tuscan style decorating ideas and assist you in learning the history of Tuscan decor. Simple ‘Do it yourself’ Tuscan interior design tips that you can use for your Tuscany home transformation. Tuscany is such a beautiful place. Whether visiting Tuscany Italy, or wanting to decorate your home with warm tones and Tuscan colors, there’s nothing like waking up to a quaint Tuscan surround. This can be done simply by incorporating Italian accessories from Tuscany. Decorating Your Home Tuscan Style! 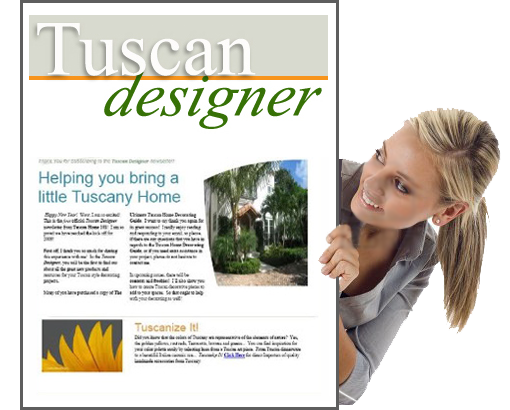 JOIN OUR FREE TUSCAN HOME DESIGN eNEWSLETTER! Get all the benefits and the perks that come along with a FREE Subscription to the ULTIMATE Tuscan Design eNewsletter… TUSCAN DESIGNER!